Think about this for a minute... There has been three (3) major fire incident in Haiti within the last month and they caused a lot of property damage because there are no fire stations and no fire trucks in the vicinity where these fires occurred... 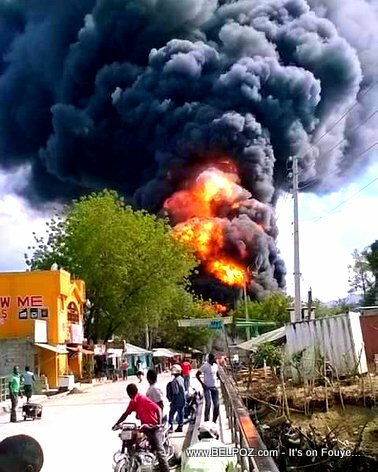 QUESTION: Which government ministry in responsible for building fire stations in Haiti? KREYOL: Haiti QUESTION: Ki Ministè ki an chaj pou mete edifice Sapeurs-Pompiers nan peyi a??? twa (3) GWO dife nan yon mwa, Kay boule, Moun mouri, Pompier Port-au-Prince... Kisa ou panse de sa??? QUESTION: Which government ministry in responsible for building fire stations in Haiti? We have to ask because you hear about all the big money and benefits that big Haitian government officials are getting yet, they do nothing, they build nothing, at least, nothing that benefits the masses.